Young Artists, an annual program at the Katonah Museum of Art for local student artists in its 33rd year, gives aspiring young artists a behind the scenes experience of mounting an exhibition at the Museum. Young Artists 2016 features artwork by more than 400 local high school seniors from over 40 high schools in Westchester, Putnam, Rockland, Dutchess, and Fairfield counties (see addendum for list of participating high schools). Participating students not only create the artwork, but also work under the guidance of museum and art professionals to organize, publicize, curate, and mount their own exhibition. Joseph Tuano from Fox Lane High School in Bedford, NY created the winning artwork for the exhibition invite. Last fall, high school students submitted designs as the capstone to a one-day graphic design workshop at the Museum. During the workshop, educators introduced students to examples of dynamic graphic work, analyzing elements of successful design. 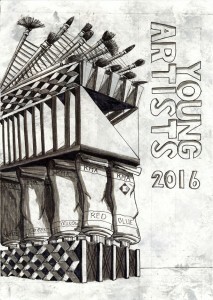 Students then created their own designs for the Young Artist 2016 announcement. Tuano’s artwork was selected out of forty-three entries based on votes from the workshop participants, the KMA Board, staff, and volunteers. This entry was posted in Exhibition and tagged exhibition, Press Release, Young Artists, Young Artists 2016. Bookmark the permalink.